Registered nurse Nathan Lovely and the team from Westmead A5B. The three words that can have a huge impact on a person’s life. R U OK? Day is a national day of action that is dedicated to reminding everyone that any day is the day to ask, “Are you ok?” and support those struggling with life. There will be free “R U OK? Day”, “Mindfulness” and “Building Resilience Through Mindfulness” sessions for staff throughout today and tomorrow on September 14. You can also find out more about the Building Resilience Through Mindfulness session in this short video. Come along to a session, get some helpful tops and connect with your colleagues. For further information and R U OK? conversation tips, visit www.ruok.org.au. 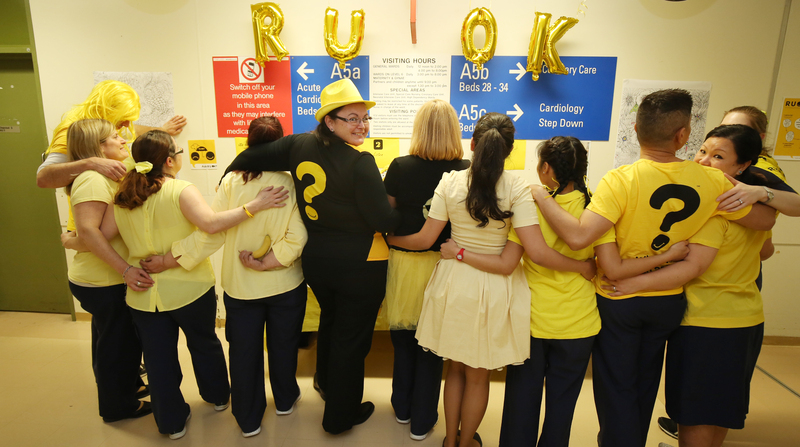 Westmead staff at geriatric medicine taking part in R U Ok? Day.